I believe we all gave a shot to writing and keeping a diary. For some reason or another, we ended up missing some days, then some weeks, and then we gave up on it completely. It's hard to keep a notebook around with you at all times, and some things you just forget at the end of the day. This is where Momento comes in, and I hope you'll give it a shot as well. 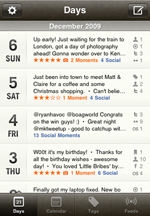 Momento is branded as an app that acts as your digital diary. It's meant to store everything from what you enter into its journal to Flickr photos, social media activity and develop a fully searchable timeline of your entire digital life. Momento comes complete with features that let you add photos to your entries, so what you get is a little nice media-rich digital diary to keep your life in order. 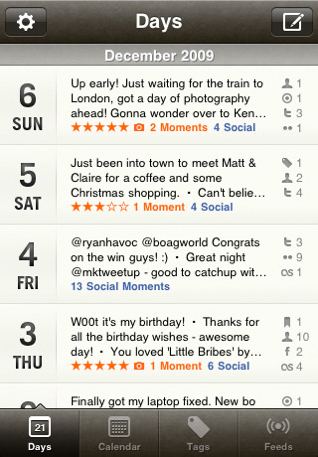 All of Momento revolves around moments, as the app calls them. These are basically journal entries that you share with Momento. To create a new moment, tap the "Create New Moment" button on the top right of the iPhone's screen and lay down your thoughts on paper, so to speak. As you create a new moment, take note of a few options you have. You can rate it using the stars at the top of the screen. You can tag places or people that appear in that moment. People can be tagged whether they are present in your Contacts or not. Tagging places will use the iPhone's GPS features. Why would you want to tag people or places, you might ask. Well, the timeline that Momento outputs is fully searchable based on these tags, and that's one of the nicest features that the app provides to you. Tagging of events is also possible, although I see less importance for these unless events are part of the daily routine (e.g. shopping at your favorite mall). You can also create custom tags and use them for tagging specific moments. Think of these tags as keywords that make that moment that much more easily searchable on the timeline. Remember though, Momento is not supposed to be your average full-fledged diary application. It's not meant to contain your deepest philosophical thoughts. They're moments and Momento is aimed at busy people that have no time for filling page after page, but rather want to remember moments, whille on-the-go. After entering a moment in, be sure to snap a photo and add it to that moment for easy later recognition. You can take a photo from the app or pick one from your library. The first thing you'll probably want to do with Momento is import all your activity so far. And where better to find moments of your past life than Twitter, Facebook, Flickr or Last.fm. Once you authorize Momento for these services, it pulls your activity and aligns it nicely on the timeline. This way, you don't have to start your digital diary from scratch. However, the feeds that are pulled are plain text, with no possibility to follow an HTML link of any kind. That may be detrimental to some users, while others amongst you will cheer at this feature. The graphics are made up mostly of wooden backgrounds and paper pages, blended to perfection with the iPhone's native UI. Momento is not meant to stand out from the crowd through its neat graphics, but rather through a set of comprehensive features you can't find anywhere else, but I must say having a easy to use interface does help with that. Momento divides the screen into four easy to manage tabs. Your List view (the timeline) shows an ordered list (by date) of every moment you've added. Your Month View will be your traditional Calendar view. The calendar tab is also very nice thought out: while it’s similar to the month view in Calendar.app, tapping on a specific date without any moments initiates a prompt to write a new one for that day. The Tabs tab will present you with a list of all tags you've added to your moments, and Feeds will break down your social feeds into sources (Facebook, Twitter, Last.fm and Flickr). The best of all, every screen has a neat little search box to make sure you can find everything anywhere at any time. Momento is YOUR digital diary, and that basically means that some moments are better kept to yourself. To achieve this, the developers implemented a nice little security measure in the app. It allows you to use a password to log in, thus securing your diary entries. The passcode is activated via the Settings menu. Certainly what may very well be your most requested feature: landscape keyboard. That's a must for entering moments on the fly. Exporting data might also be an issue. The app is fully backed up using iTunes sync, but for more advanced users, a neat export feature could be implemented. Nevertheless, amongst the other "dear-diary" apps out there in the AppStore, Momento is the most content-rich I've seen and I recommend it wholeheartedly to all of you. I have a free promo code to give out, so leave me a comment down bellow and I'll email it to you. First come, first served! What do you think of Momento ? Scroll down for our comment section and let us know! Stuck On A Crossword Puzzle? Hire Agent X Word! Great review! 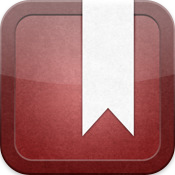 Best one to help me get an idea of what this app does! Don't suppose you have anymore codes to give out? Loved the review! Seems like an app I'd love to try! Just sent you the code via email. Enjoy and let me know what you think! Would love this app!!!!!! Any more codes available?? ?